Microsoft researchers have taken the wraps off a touch based sphere prototype that uses an internal projection and vision system to bring a round computer display to life. People can interact with the surface with multiple fingers and hands to manipulate photos, play games, spin a virtual globe, or watch 360-degree videos. Sphere, as it’s known, is purely a research project. The company says it doesn’t currently have plans to offer it as a product. The idea is to see what the technology can do, and how people will use it and is a cousin of the Microsoft Surface tabletop computer. The system employs advanced algorithms to translate images designed for a flat computer screen so that they appear properly on the rounded globe. The unit also ingrates an infrared system that can sense when hands or objects are placed on the sphere, to let people interact. In the spherical version of the classic Pong arcade game, people place their hands on the surface to direct the bouncing balls inside the sphere. In doing my investigation of RSS authouring tools that I outlined in Part 1 of this blog I came accross an obsure posting at a site called Get Satisfaction. In reading the posts it turned out that Twitter RSS feeds were changed to require authentication. When my Yahoo Pipe went out to get the RSS feed from Twitter, it was rejected because my pipe, and as far as I know all Yahoo Pipe components, lack the ability to authenticate access to RSS feeds. 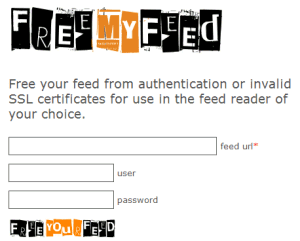 In further following the posts someone suggested that an internet service called Free My Feed — a free and simple service where you don’t even have to create an account– takes a Twitter RSS feed along with the account login information and produces a second authenticated RSS feed that can be read by Yahoo Pipes and pretty much any other RSS reader. It only took me a few minutes but it turned out that the rss feed produced by Free My Feed could be cleanly read by Yahoo Pipes and I was back in business. I had to write a new pipe because of the restrictions that Twitter had added but in the end I have a system that is a lot easier to understand. Its documented on one of my Googe Sites. For the past few days I’ve been rained out of the video shooting that I had been planning to do. I decided that this would be a good time to develop a few more skills in understanding RSS feeds for both my blogging and digital signage work. The skills will probably come in handy when I get back to work. It became necessary for me to learn about RSS because we decided RSS feeds would provide the best content backbone for a digital signage project we were working on at Ryerson University. After a lot of work I thought we had developed a system that employed Twitter and Yahoo Pipes that met our needs. But over time Twitter has not proved to be a consistent service for RSS feeds. For some reason Twitter’s integration with Yahoo Pipes was changed without notification. It was to the point where my Yahoo Pipe that I employed stopped working. I had to use the RSS output from Tumbler’s Micro Blogging site as the RSS feed to my WordPress blog to get around the problem. Now I find what I devised to be complicated, convoluted and the combination is not working to my satisfaction. So I decided to explore other alternatives to generate RSS feeds. I won’t go into the gory details of my first efforts creating the Twitter Yahoo Pipes (documented here) but I found Twitter’s 140 character limit to be ideal for Digital Signage applications. As a cloud service Twitter automatically provided the policing to limit the text in digital signage posting and once the message was posted to Twitter it automatically generated an RSS feed that Ryerson’s digital signage system could pick up and display. The feeds only problem was that it would add the account name to the head of the post. The service I discovered to fix this problem was Yahoo Pipes. Pipes which is a free mash up tool, and a pre-made pipe that would eliminate the account name from the Twitter feed and re generate a new feed that could feed the Digital Signage system (and my blog). As I mentioned earlier it worked great for the longest time and then stopped working. All attempts to fix it have been difficult given Twitter’s irregular operating schedule and unannounced changes to its services. For something called Really Simple Syndication, its something that is really difficult to author (or at least find out how to author). When I first went to the net all I could find were sites that would tell me how the files were formatted. I had trouble even finding the simplest tool to help me create an RSS file from scratch. Even a trip to Toronto’s Worlds Biggest Bookstore was no help in finding a good book on RSS. I finally learned– after much reading and fusing– that an RSS file is little more than a standardized XML text file that is placed on a central server –usually a web server–. Because its standardized other devices can read and extract elements of the data contained in the text file. Hence the formatting is important so the precise information that one wants from the file can be extracted accordingly such as into Ryerson’s Digital Signage application. When I work I like to keep things simple if I can. Given that my days plans were rained out I finally had the chance to look for some simple authoring programs. The best program I found was actually a live web RSS Feed Creator application put on-line by the University of Mississippi. What is good about it is it creates an RSS feed on the fly that I could cut and past into Notepad. I could then save it manually as a .rss file and sent to my web server for testing. What I liked aboutthe webpage was that I could see the data being added to the RSS file in real time. This helped me immensely in better understanding the formatting of RSS files. I did a quick test using the website and Tristana Reader and the output seemed to work fine. Another bonus is that the Java code found on the webpage is quite editable. I used it to create a personal wepage that would create an RSS feed. I also I tried a number of desktop based RSS authoring tools. RSS Builder (Freeware) has a built-in FTP client that allows for the RSS file to be downloaded to ones website. It authors in RSS 2.0 and having tested it, I know it creates RSS feeds that work. RSS Builder also allows one to save and reload existing files for updating before being republished. If you don’t like freeware I found Tristana Writer to be very good with similar features to that of RSS Builder. After playing with these tools for some hours I ended up gaining a much greater practical understanding of RSS Feeds and how they are generated. So what did I do to overcome my problem with Twitter and Yahoo Pipes? I came across an obscure post on the root of the problem and I found a solution. I’ll cover that in my next post. To anyone who is close to this business, storage systems that contain terabytes of information is common. However terabyte hard drives are now becoming mainstream in the consumer space so Hitachi released the video below to outline the advantages of the technology. It’s a pretty funny video and kinda reminds me of the old Peter Puck video’s that used to run on ice hockey broadcasts to explain the rules of hockey. Enjoy…..
About the only standard projector(s) that I’ll post on from InfoComm 2008 are Canon’s. At the conference Canon released the WUX10, the world’s first WUXGA (1920×1200) projector using LCOS technology along with the SXGA SX80. Both of these projectors feature LCOS (Liquid Crystal on Silicon) and the WUX10 is the highest resolution of any Canon projector incorporating a 0.71-inch WUXGA, the world’s first LCOS panel of its size to achieve such a level of resolution. The SX80 features a 0.55-inch SXGA (1,400 x 1,050 pixels) panel. The panels eliminate the “screen door effect,” which is a visual distraction common to LCD projectors. The SX80 Multimedia Projector is being the world’s first projector to offer PictBridge connectivity. In addition, both of the new Multimedia Projectors feature Canon’s AISYS (Aspectual Illumination System) Optical Engine and also feature newly developed Genuine Canon 1.5x Powered Zoom/Focus Lenses. In addition both projectors feature Off and Go (which allows users to pack-up quickly after a presentation by simply unplugging the power cord while internal circuitry continues to run the fan and cool the projector), auto Set-Up functions for focus, keystone, signal inputs and screen color-correction; and an RJ-45 Connection with a built-in network interface for centralized monitoring of projector units. I’ve been interested for some time in what is happening in the area of pocket projectors and it turns out that InfoComm is one of the best places to see the latest developments in this area. The Atlantis Mobile Cinema Ultra-Mobile Multi-Application Mini Projector (model APSE-10A) is touted by Atlantis to be the world’s first pocket size projector. According to their website it provides high resolution projection video up to 50 inches in screen size,providing clear VGA resolution pictures. It uses a built-in battery that makes it ideal for presentations in remote areas. 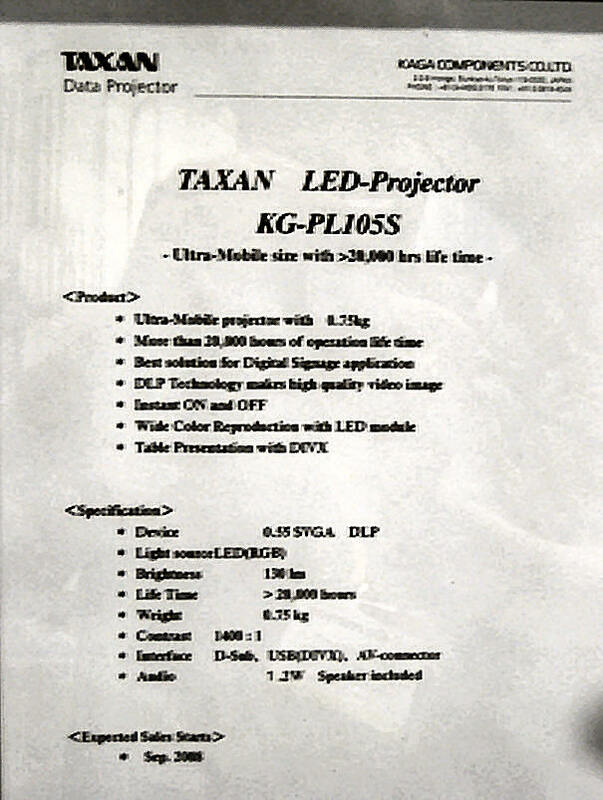 Finally the last one that I got a look at was the TAXAN KG-PL105S. Other than the link provided there is not much that I can tell you about this unit other than to click on the pictured specification sheet to enlarge it. The following is a series of links to some of the other things that we saw at InfoComm 2008.